Purchasing a new landscape vehicle can be a weighty decision. That’s why we spoke with experts Chad Semler, director of product marketing for medium duty at Navistar, and Brian Tabel, executive director of marketing at Isuzu, to get the lowdown on purchasing new vehicles. The first factor for contractors to consider is the truck’s application, which will help determine the payload — and most likely the truck model. Tabel adds that the intended mileage for the vehicle also should be factored in, as this may determine whether a contractor chooses a diesel or gas truck. Other options to consider include the cab’s size and seating capacity, depending on a company’s crew size; an open or closed body, determined by the weather and security level of an area; fuel tank size; and the size of the truck itself. Semler and Tabel say that landscapers tend to prefer smaller-sized trucks, typically in the Class 4/5 range, although Semler says some of the truck options creep into the Class 6/7 range. “Landscapers are mostly driving in neighborhoods and business parks, so maneuverability is key,” Tabel says, adding that visibility is also an important consideration. As far as other trends go, Semler mentions four-by-four drive configuration, which allows trucks to travel off-pavement, and Navistar’s forward-tilt hood that enables easy access to maintenance points. Both Semler and Tabel agree contractors should defer to their local dealers for the specifics surrounding their truck purchases. 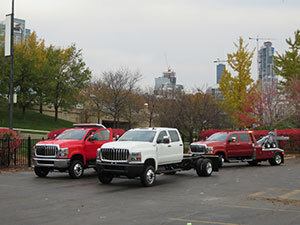 “The dealer is really the expert to help guide landscapers to the proper trucks,” Tabel says. He adds that some dealers may offer incentives if a customer is a member of certain associations. Customers who purchase multiple vehicles at one time — 10 in Isuzu’s case — may also qualify for special fleet incentives. Regarding the ideal time to purchase, Semler and Tabel say there is no best time, but many landscapers tend to buy during the winter so new vehicles are ready to go come spring. In the future, Semler says telematics will gain more traction. “Landscapers can not only track the truck’s location, but they also can get an early warning if there’s anything wrong with the truck,” he says. Tabel says he thinks electrification for trucks will begin to catch on within the next 10 years. “As electrification dabbles in the car market and becomes more and more popular, I think it will move into the truck market as well,” he says.